In terms of finance and communications, politics as usual--political candidates and narratives mandated by the parties' Ruling Elites and the MSM--is dead. Hillary and Trump are symptoms of a fatal condition: politics as it has been practiced for 70 years is dead. As my friend G.F.B. observed, the key development was not the nomination of insider-Hillary or outsider-Trump--it was the enormous success of Bernie Sanders' campaign, a campaign that arose outside a Democratic Party establishment that tried to suppress or destroy Sanders' campaign at every turn, a campaign funded not by the Goldman Sachs of the world that funded Hillary but by tens of thousands of small donations from the citizenry. Who drew the mass crowds of enthusiastic supporters? Bernie, not Hillary. Who inspired thousands to donate small sums that quickly accumulated into millions of dollars? Bernie, not Hillary. Who won primary after primary despite a virtual Mainstream Media blackout and a Democratic Party establishment that relished plunging a poisoned blade into Bernie's campaign at every opportunity? Bernie Sanders, not Hillary. Many observers believe an accurate accounting of votes would have revealed Bernie received more votes than Hillary did in aggregate. In terms of mass crowds and voter enthusiasm, there was no contest at all: Bernie won hands-down. In a parallel fashion, Donald Trump's campaign succeeded despite the active resistance of the Republican Party establishment. By some accounts, Trump's campaign has received more small donations than any other recent Republican candidate. As for Mainstream Media bias: Bernie was fortunate to only be blacked out, Soviet style; Trump has zero MSM newspaper endorsements and has been subjected to MSM bias that is laughably ham-handed, reminiscent of old-style Communist "running dogs of Imperialism" propaganda. By the established rules of politics as usual, it wasn't supposed to happen this way. Hillary went out early and raised millions of dollars, the acme of campaigning success in politics as usual. Having banked millions for advertising, she was supposed to cruise to victory. A mainstream blah-blah-blah Republican candidate was supposed to emerge from a bloodless primary, and the two Party insiders were supposed to engage in the usual polite jousting of an election that was pre-ordained to change nothing in the political, economic and social orders. Hillary's disdain for average Americans of all genders and ethnicities is not an outlier; it's the unspoken norm of the Ruling Elite. In politics as usual, Party bosses (backed by big-money contributors) ordain the candidate and then send down the order to the little people to support the candidate. As G.F.B. observed, technology has leapfrogged the parties' reason to exist and the Mainstream Media's role of coronating the parties' candidates and policies.The political parties arose to fill critical financial and communications needs: a mechanism was needed to aggregate campaign contributions and to distribute party platforms and narratives to far-flung voters. The parties took on a larger role after World War II, which transformed the U.S. from an industrial trading nation wary of foreign entanglements into an interventionist global empire. 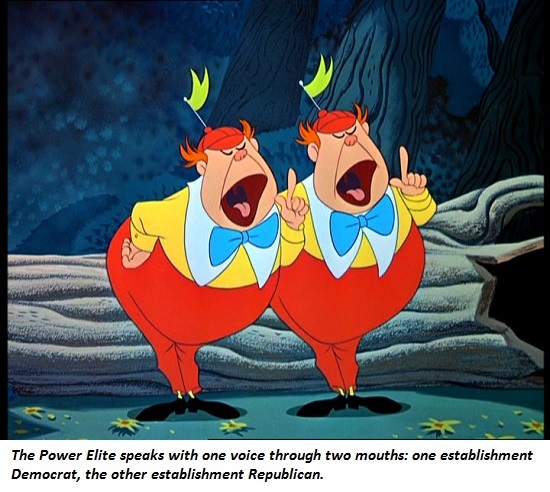 The foreign-policy differences between the Democratic and Republican parties shrank to semantics, as both party Establishments embraced the globalist agenda and narrative. In the postwar era, the Mainstream Media of newspapers, magazines, radio and TV broadcast the Ruling Elite's narratives and agenda. Broadcast blanketed the nation, and dissenting views were relegated to the margins: I.F. Stone, Ramparts magazine, etc. With the rise of the Internet and social media, broadcast propaganda is now competing with narrowcast: blogs, Twitter and Facebook enable self-organizing tacit tribes (G.F.B. 's term) with their own networks of communication, narratives and agendas. Bernie Sanders' campaign showed that candidates no longer need the Party Establishment to raise substantial sums of cash. Stripped of the power to control the flow of contributions from millions of individuals, the parties have been reduced to bastions of everything that is corrupt, venal and backward-looking about politics as usual: big-money contributions from the likes of Goldman Sachs, Big Pharma, Saudi princes, etc. Tens of millions of Americans are rejecting both the parties' Ruling Elites and their globalist, interventionist consensus. The technology of micro-payments has leapfrogged the party Establishments, and the Internet has leapfrogged the MSM and parties' control of narratives and agendas. The MSM and the parties' raison d'etre has been dismantled by technology. As ownership of the media and the control of party insiders have become increasingly concentrated in the hands of the few, competition from the many (narrowcast) has exploded. In terms of finance and communications, politics as usual--political candidates and narratives mandated by the parties' Ruling Elites and the MSM--is dead. We will all look back in 2026 and wonder why the recognition of this reality took so long. Thank you, Stephen W. ($10), for your most generous contribution to this site-- I am greatly honored by your support and readership.